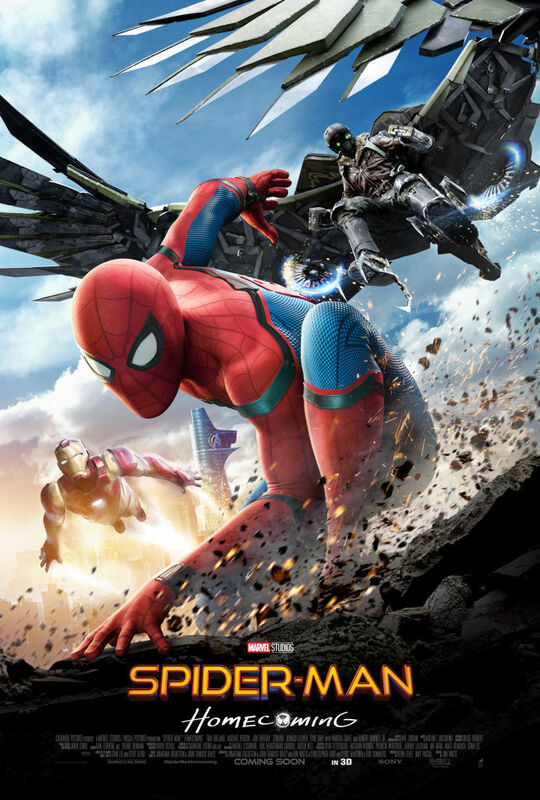 It came out a bit ago and last weekend I finally saw it after being pretty good about avoiding spoilers, and I have to say, "Spider-Man: Homecoming," was a really good movie even if it isn't one of the best Marvel movies ever. I suppose the problem is that with so many Marvel flicks now that are at least good it can be hard to be the, "Best," but when you're super-enjoyable like, "Homecoming," that's perfectly fine. You've probably seen, "Homecoming," by now or don't mind spoilers so know I'm going to throw some out there. How about we break things down by what I liked and what I didn't like that much? Yeah, let's do that! The acting was superb. 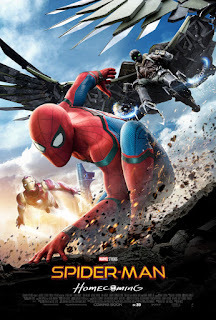 Tom Holland makes a pitch-perfect Peter Parker and Spider-Man, Robert Downey Junior as Iron Man continues to be amazing, and Michael Keaton steals the show as he illustrates why he is such an amazing actor. That scene where Peter is driven to Homecoming by Keaton (who is revealed to be his date's dad and we already know by then he is the Vulture) whilst Keaton slowly realizes how Parker is Spider-Man has got to be my favorite scene in the movie. Plus, Marisa Tomei is always welcome. The street-level view of a world where the Avengers exist is clever. It's a world with heroes which has therefore changed, but still is recognizable. I know the Marvel Netflix shows kind of do this too (and, "Agents of Shield," if you remember that exists) but this movie really delves into that, which I like. We also answer the question finally of how all that damage to NYC from the first Avenger's movie was cleaned-up. Thank God we don't get a ton of origin or back-story, because at this point I think watching Uncle Ben die one more time will drive me insane. At one point a spider-bite is mentioned and the movie has a prologue where we see Spider-Man's role in, "Civil War," fleshed-out a bit, but no long drawn-out tale of how he got his powers. Thank you God. The movie is funny, as most of the Marvel flicks are, but doesn't border on too funny like the, "Guardians of the Galaxy," flicks sometimes get dangerously close to doing, bordering on being more of a comedy. "Homecoming," knows when to crack some jokes and when to give us some serious bits. 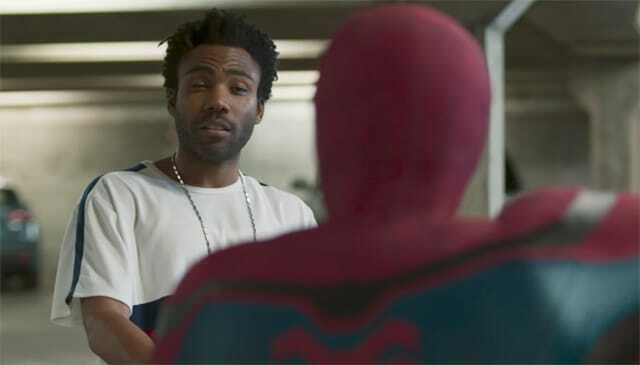 I wish we got more Donald Glover. He is so great and clearly they are hinting he could become the Prowler based on his character's name--plus the mention he makes of a nephew hints that Miles Morales exists too! It's a little nit-picky, but how is Spider-Man getting away with operating in Queens so flagrantly when heroes are supposedly regulated now? The, "Sokovia Accords," even get mentioned when Peter is in a class. Is the fact the Spider-Man mainly sticks to Queens as opposed to going to other countries what keeps him exempt from that sort of regulation? I mean, he isn't exactly under-the-radar as evidenced by when he makes National news saving people at the Washington Monument (which is damaged in manner that is actually mostly his fault, but people don't know that, thankfully for him). Nothing else really occurred that I disliked, it all was pretty good, if not utterly amazing. In some ways the lack of much that made me go, "Whoa," outside of that stellar car-scene is a little bit disappointing, but if I can see a movie that is a solid 4 out of 5 stars. Pros: Tom Holland is an excellent Peter Parker, and that's almost more important than being a good Spider-Man. And I actually believed Keaton's Vulture. The biggest surprise for me from an acting perspective is how much I liked Marisa Tomei's Aunt May. Cons: I got a little tired of the Spider-Suit & the AI. Also, I'm not so sure Iron Man and Happy warranted so much screen time. I think the story could have held it's own with a little less.